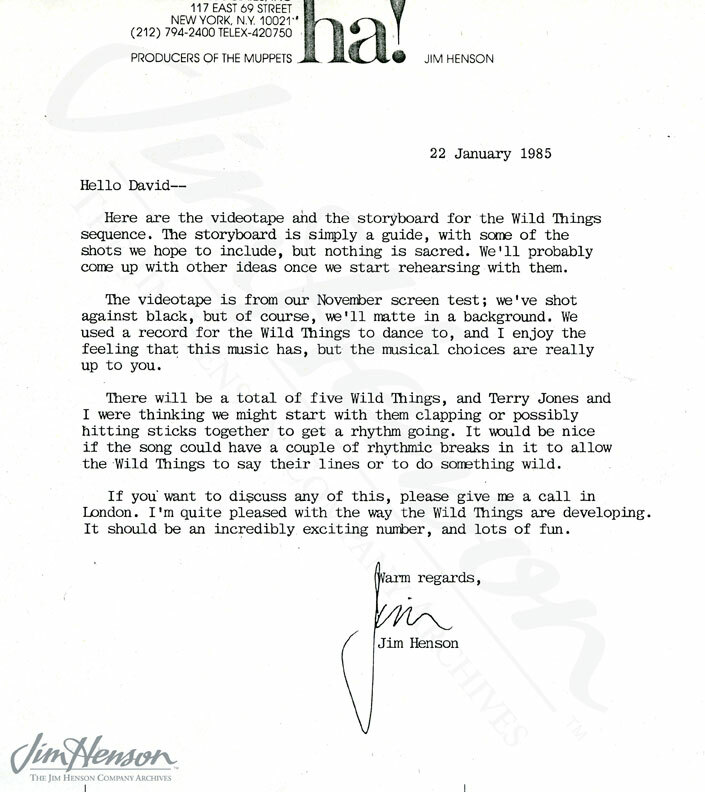 Special care went into shooting the wild things (later dubbed Fireys), loose-limbed characters that danced crazily, tossing their body parts and removing their eyes as they sang “Chilly Down”, the first song Bowie wrote for the film. Way-laying Sarah, they were, as described by Bowie, “…a bit cruel, but infectiously hilarious.” The intricate routine grew from Jim’s original notes and storyboard, worked out by choreographer Charles Augins. With four weeks of rehearsals, Augins discovered that, “…there’s nothing a puppet can’t do, which is very useful!” To perform each of the five Fireys, four puppeteers were required, each wearing black velvet so that they would disappear into a black backdrop. 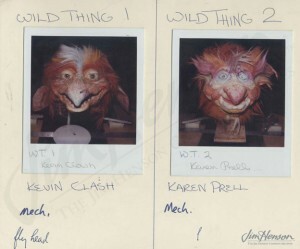 They maneuvered the various body parts, but according to Augins, there was one thing the puppets could not do in the pre-digital age — they “…couldn’t make the Fireys cross one another, or turn around, because the puppeteers’ bodies would block each other.” It took two weeks to shoot the sequence and another two weeks doing special shots with the second unit to complete the scene. An equally complicated scene was the Shaft of Hands. George Gibbs and the special effects team devised a thirty-foot high shaft for Sarah to descend accompanied by a camera mounted on a forty-foot vertical camera track. The 150 live hands that grabbed at and interacted with Sarah were supplied by 75 puppeteers and assistants and augmented by an additional 200 foam-rubber hands. Connelly remarked, “It was fun! Some of the hands passed me little notes during breaks, others tried to communicate in sign language.” Jim said, “It’s certainly one of the most bizarre and unusual sequences I’ve ever used in a movie. 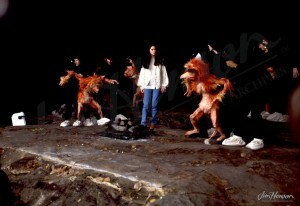 But then Labyrinth is full of bizarre and unusual sequences!” One idea that didn’t make it into the film was a scene in a giant pinball machine; it would have been a challenge for the effects team, but as far as Jim was concerned, the possibilities were infinite. See how the Fireys scene was shot. 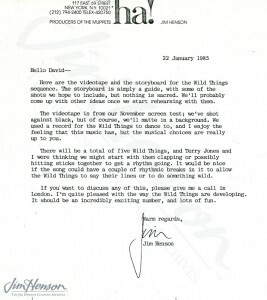 Jim’s note to David Bowie about the Firey sequence in Labyrinth. Casting chart for Firey sequence. Sarah (Jennifer Connelly) on the set with the Fireys. 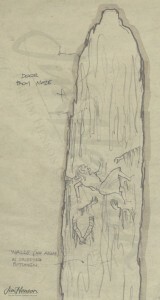 Elliot Scott’s design for the Shaft of Hands sequence. 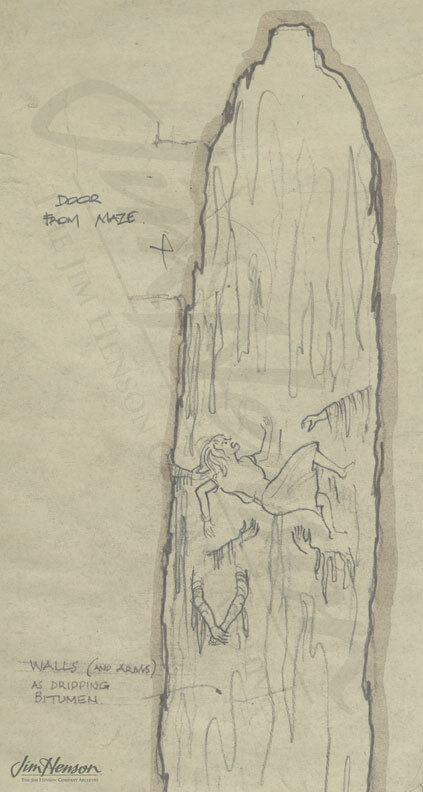 This entry was posted in 05-May '85, 1985, Labyrinth and tagged David Bowie, Fireys, George Gibbs, Jennifer Connelly, London. Bookmark the permalink.